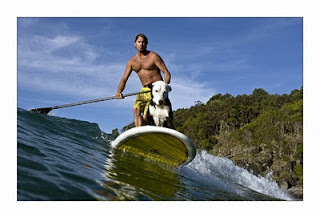 Good luck to all the dogs surfing today in the VetShopAustralia.com.au Surfing Dog Spectacular. We're all really excited! If you're in or near Noosa, Qld then make sure you get down to the event, and be sure to come up to the VetShopAustralia tent where Dr Mark and our fabulous team have heaps of fun stuff and giveaways for dogs (and people) that love the surf. You'll also be able to meet Advantage Family™ A-Team member, Giaan Rooney, who will make a guest appearance to show her support for the furry surfers. The VetShopAustralia.com.au Surf Dog Spectacular will take place today (March 11, 2012) at 4:30pm at Noosa Main Beach as the main attraction of the opening ceremony at the annual Noosa Festival of Surfing. And if you're dog loves to surf, swim or just get wet, visit www.surfingdogspectacular.com for your chance to win a great water dog pack valued at over $100. Free to enter and we've got 10 to giveaway!